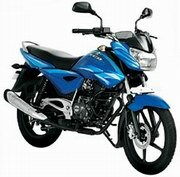 Harga Motor Bajaj XCD here is the average price of the Big City Like: Jakarta, Bandung, Medan, Surabaya, Semarang, Makassar, Denpasar from various stores and Dealer standard. Sport motorcycle Bajaj XCD 125 DTS-Si output of automotive manufacturers from India, Bajaj Auto Limited, now has a new look, with an additional disc brakes. Bajaj Motorcycle XCD 125 DTS-Si is claimed to be able to give off the maximum power at 9.53 PS at 7000rpm and torque 10.85 Nm at 5000rpm. Also recognized as the Most Fuel Efficient Motor Sport in Indonesia. DTS-Si technology makes Bajaj XCD 125 has economical motor fuels through a swirl maximal induction, that is engine speed technologies that produce more efficient combustion.